Chinese President Xi Jinping said on Thursday that China is well on track to deliver a "spectacular" Winter Olympic Games in 2022. 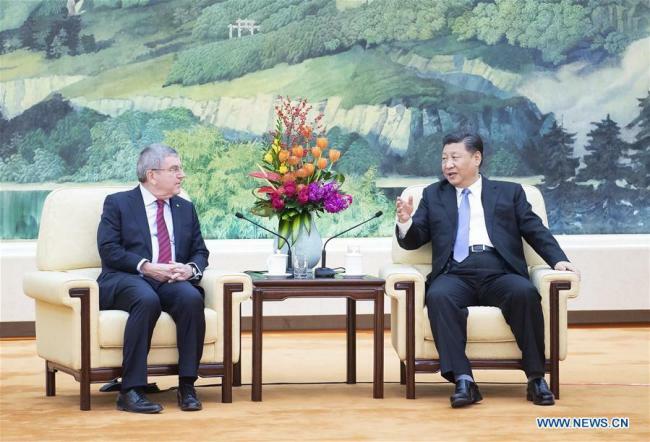 President Xi made these remarks while meeting with International Olympic Committee (IOC) President Thomas Bach at Beijing's Great Hall of the People. Xi stressed that the Chinese government was firmly committed to staging a "green, inclusive, open, and corruption-free" Games, adding that preparations for the 2022 Winter Olympics are either on track or ahead of schedule. Emphasizing zero tolerance on doping in sport, Xi said: "We should make the Olympic Winter Games as pure and clean as snow and ice." Xi also paid tribute to Bach for the IOC's long-term support of China's sporting development, as well as its contribution to world peace. Bach, who inspected several of the 2022 Winter Games' venues in Zhangjiakou and Yanqing on Tuesday, said he was impressed by the efficiency and dynamism he has seen in China's preparatory work. The IOC chief also expressed his satisfaction over the cooperation between Chinese organizers and the IOC, adding that he was confident that China would put on a spectacular Winter Games.